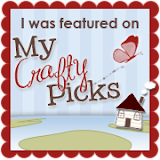 I was nominated by Shauna to take part in this week's Creative Blog Hop (Thanks so much Shauna - be sure to stop by her blog and say hi from me!!). As soon as I said yes to Shauna's nomination I knew what I wanted to create - I haven't had near enough play time with my Blendabilities and was so looking forward to using them! Unfortunately towards the beginning of last week Stampin' Up! announced that the Blendabilities line was being discontinued due to manufacturing issues that couldn't be resolved. I was saddened by the news but since I already had my card created by that point I thought I would share it anyway; I hope you don't mind! I'm sure you'll see a few creations pop up on my blog in the future using them because I simply can't part with them just yet. 1. What are you currently working on right now? At the moment anything and everything Spring related! I have a couple of little Easter projects planned and a 3D Flower bouquet I'm working on as well; not to mention the stash of miscellaneous cards I always like to have on hand. It's so nice to not stress when an occasion comes up because of that little stash! I love working in a 3D format and am constantly pushing myself to look at something that otherwise might be created in 2D and figure out how to make it otherwise! I try my best to think "outside the box" and create things that might not have been seen before or seen in the same way it always has been seen in the past. 3. Why do you create like you do? I like the challenge of having to think differently then others might. I've always loved to have a creative outlet of some sort and have crafted in some form or another my entire life. My background is Interior Design so many of the skills I learned while in College have transferred themselves to the work you see in my blog today. I feel a great sense of calm while I'm paper crafting and an even greater sense of accomplishment when I see a vision come to life! I spend a lot of time thinking and planning before I begin a project, probably to a fault LOL. I sit and visualize a project start to finish before I ever touch a piece of paper. Sometimes that involves sketching but more than often its just quick note taking so I can organize scattered thoughts. Most of my ideas come to me in that in between awake and sleep stage so I keep a notebook by my bed to jot ideas down before they disappear (weird I know, right?). As with most creative folks I use social media as well. I love Pinterest and look for inspiration there if I'm stumped - it's pulled me out of a creative rut more than a time or two! With all that being said, I'm off to get a couple of those projects done! It's an awful place to be when you have tons of ideas rolling around in your brain and not enough time to get them all done LOL! 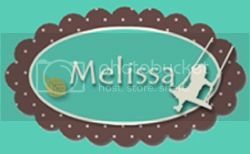 Wow, Melissa - your card is gorgeous!! Your colouring is beautiful, and you are the master at fussy-cutting! :) Thanks for nominating me for next week. this card is wonderful; I'd love to get this in the mail. love, love, love it....i enjoy the fussy cutting, but in my mind i'm trying to figure out how you got the scallop cutting on the one side....are you giving out your secret? Lovel rendition of this stamp! I'm like you—I'll be using my Blendabilities until they are all dried out! Melissa, your card is absolutely beautiful! I am rather sad about the Blendabilities too ... Sigh. 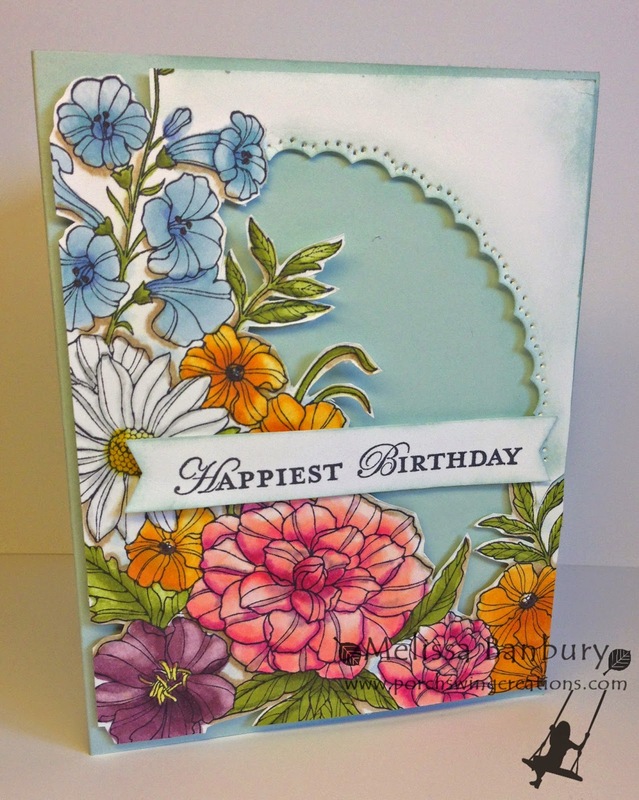 Love how pretty this is, great colouring and really wonderful layout with the details and fussy cutting! 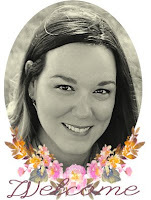 This is such a fun blog hop...I'd forgotten to work my way along Shauna's line, going back to her and will watch for Deborah's next week. 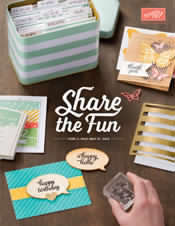 I'd nominated Krista Frattin and she's introduced us to the Stampin'Dude...it really is like a chain letter!